With the new technical possibilities of worldwide electronic networking and the ubiquitous employment of new media and digital technology in various fields of research and practice, conventional disciplines are gradually dissolving as new transdisciplines develop. Contemporary architecture too resides in a state of transgression that gives rise to new architectural conceptions benefiting from a multitude of influences. 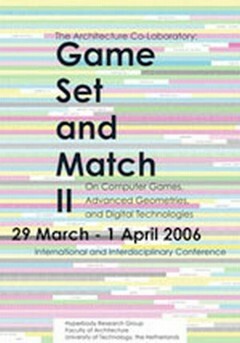 This publication brings together the manifold, international and interdisciplinary contributions to the 'GameSetandMatch II Conference - The Architecture Co-Laboratory,' directed by Kas Oosterhuis, Professor at the Faculty of Architecture of the Delft University of Technology, the Netherlands. It addresses contemporary and future changes within and across the boundaries of digitally-driven architectural and design practices. The notion of architecture as a co- laboratory accentuates this strong devotion to experimentation and collaboration. In so doing the publication offers a kaleidoscopic view of rather than a defined perspective on current developments in the digital design domain. The authors of the essays and papers included in this book come from very diverse backgrounds ranging from architecture and design to technology and engineering as well as computer sciences and humanities. An interlaced series of three thematic areas - Play, Geometry ++ and Open Source - will relate diverse sources of knowledge and enable the reader to cross-reference, ask questions, view contexts in a different light and even create new connections between the presented contents. This collection of writings serves the generally interested reader as well as the scientific reader and provides a source of discussion to draw inspiration and motivation from.